For the second annual Critical Issues in Higher Education Conference sponsored by the State University of New York (SUNY) in November 2012, New York Sea Grant was invited to present a poster that shows how NYSG exhibits “systemness” by interacting with other campuses in the SUNY system. The conference entitled Harnessing Systemness, Delivering Performance, aimed to explore new models for building and rebuilding higher education to meet the economic and political challenges ahead. SUNY Chancellor Nancy Zimpher explains the term systemness this way: “The State University of New York has so many assets, but there is not one greater than our ‘systemness.' Beyond the individual strengths that each of our 64 campuses possess, there is a powerful and unmatched capacity to reach our most ambitious goals together and to realize our highest achievements.” In other words, by working together, the many campuses across the state can produce better results than each of them working apart. 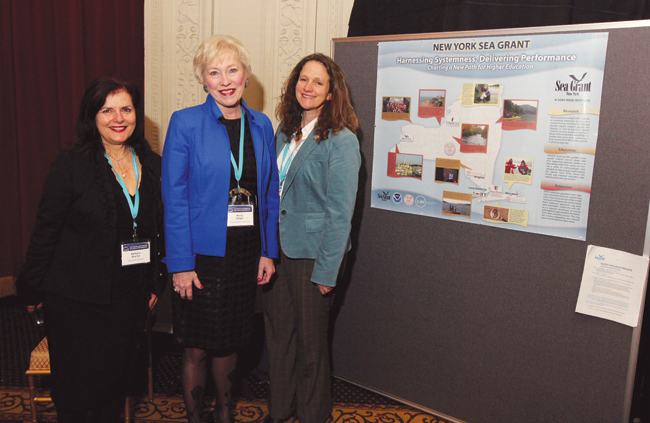 New York Sea Grant, a partnership of SUNY and Cornell University with funding from the National Oceanic and Atmospheric Administration, is itself an example of ‘systemness’ at work by drawing on the talented pool of researchers from universities and colleges throughout the state and working with extension specialists who are part of Cornell Cooperative Extension. During the conference, administrators and faculty from throughout the SUNY system attended sessions about important issues facing higher education such as public policy, changing demographics, and resource allocation led by speakers not just from the SUNY system, but leaders from major university systems around the country. The NYSG poster on view during the conference gave just a few examples of the SUNY interactions that help further NYSG research and outreach throughout the state with efficacy. Working together, researchers from SUNY College of Environmental Science and Forestry and the University at Buffalo are tackling the problem of harmful algal blooms that occur in popular Sodus Bay in Lake Ontario. A research group from SUNY College of Veterinary Medicine at Cornell University is credited with discovering how a virulent pathogen in fish (Viral Hemorrhagic Septicemia Virus) is transmitted. Numerous climate change research projects have been funded at Stony Brook University and climate change educational training at SUNY College at Brockport. 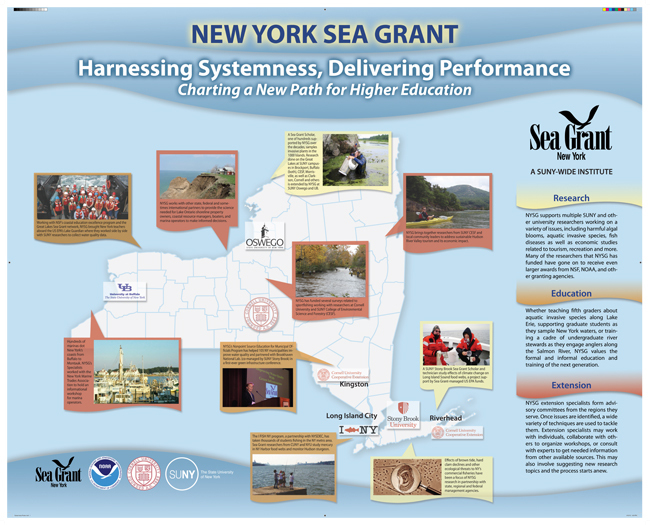 For a more complete list of New York Sea Grant projects and examples of systemness, visit the list of recent research (pdf) and view the poster (pdf). 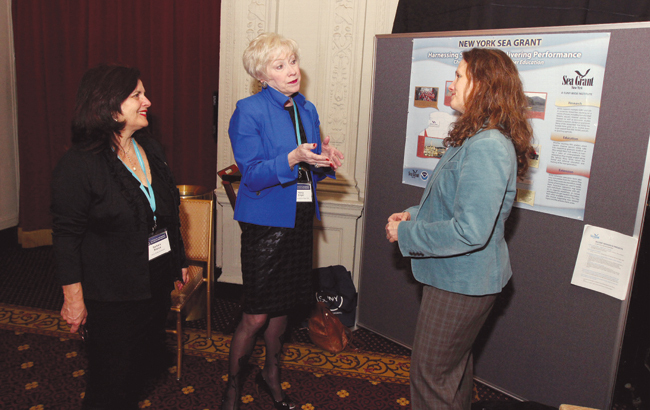 New York Sea Grant joined The State University of New York for a two-day New York City-based "Systemness" Conference in early November 2012. NYSG's poster (pictured below), which was on display during the sessions, highlights the program's coastal research, extension and education efforts state-wide through the SUNY campuses as well as with Cornell University, Sea Grant's other partner institution in New York State. What exactly is "Systemness"? It's a concept that encourages connectivity between the many programs and initiatives under the SUNY umbrella. During the conference, new models for this concept are being explored as well as ways these 'system' models can be retooled and rebuilt to meet current (and future) economic and political challenges. An emphasis on the ever-growing public need for higher education is a common theme for the discussions. 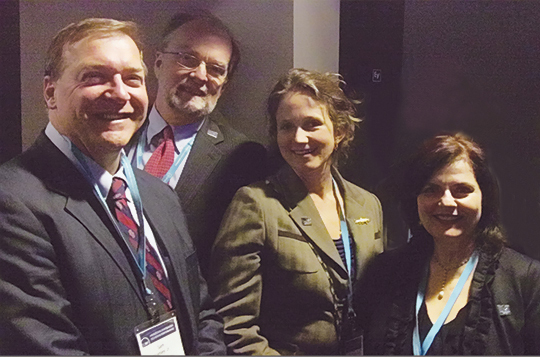 Dr. Samuel Stanley, President of Stony Brook University (left) at the 2012 SUNY Systemness Conference with (l to r) Dr. Jim Ammerman, NYSG Director; Dr. Kathy Bunting-Howarth, NYSG Associate Director; and Barbara A. Branca, NYSG Communications Manager.